The Konica Instant Press is a professional-quality instant camera sold circa 1983-84 by Konica. It integrates a Polaroid-branded CB103 film back which accepts 3¼×4¼" peel-apart instant film. Like the top-grade folding Polaroid packfilm models (the 180, the 190, and 195), the Konica Instant Press offers a superior lens (a Hexanon 110mm f/4.0) and full manual control over exposure settings. The Copal #0 Shutter runs from 1 second to 1/500, plus T and B; and a white lever above the lens (without click stops) sets apertures between f/4 and f/64. The minimum focus is only 0.6m. This is much closer than Polaroid professional (180, 190, 195) cameras, whose closest focus is approx. 1.3m. 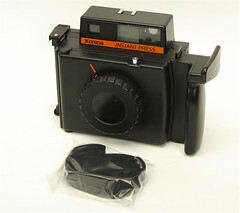 It is also closer than the Fuji Fotorama FP-1 with a minimum focus of approx. 0.8m. 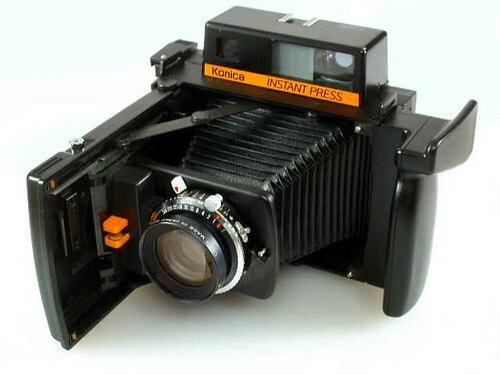 The Konica Instant Press does take some features from the iconic press cameras of the mid-20th century, such as the Speed Graphic. 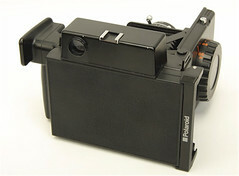 It folds closed into a sturdy package, retracting the lensboard using bellows; and it focuses via a top-mounted rangefinder/viewfinder (having just a single eyepiece, unlike some Polaroid models). The Konica also pays special attention to ergonomics, with a large handgrip for the photographer's left hand molded into the camera's plastic body. Focusing is done with an oversized knob in the center of the fold-out front panel (reminiscent of 1950s Polaroid Pathfinders); from here the shutter release is within finger reach atop the front edge of the door. This is threaded for standard cable releases. The numbers of Konica Instant Press cameras produced were apparently not large. Because compatible instant packfilm from Fujifilm remains available (as of 2011), this remains an eagerly sought-after model today. This page was last edited on 14 November 2012, at 03:50.